Undoubtedly an essential measurement tool for process automation, quality control and tool automation control. The Accumeasure D capacitance displacement sensor series amplifier is a revolutionary design that uses the latest technology to convert a highly reliable capacitive electric field measurement (displacement) directly into a highly precise 24 bit digital reading to accurately measure position, thickness, motion and vibration. The standard feature quadrature encoder input, provides probe positional information simultaneously with its displacement signal by synchronizing displacement measurements to the probe position to provide accurate surface profiles of various conducting and semi-conducting targets. MTI’s Digital Accumeasure capacitance displacement sensor amplifiers comes standard with 24 bit USB/Ethernet digital output. The analog output model includes the analog output in addition to the standard digital output. Both may be used simultaneously. This is ideal for closed loop applications or integration into systems that require analog. Our new capacitance amplifier converts the probe capacitance directly to target gap (distance). This direct conversion approach eliminates errors that traditional analog amplifiers have due to analog filtering, linearization, range extension and the summing of channels to obtain thickness or step measurements. With the Accumeasure D series, filter frequency response, sample rate, linearization and probe range are all digitally controlled. This ensures the most accurate data capture, lossless processing and the freedom from having to purchase additional acquisition hardware. 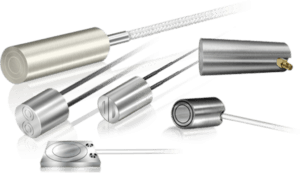 Contact MTI Instruments directly with any questions about our digital capacitance sensor measurement systems. Part 4 Why go Digital? Part 3 What can I measure with a capacitance displacement sensor?